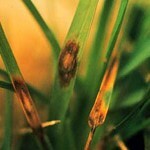 Most turf diseases in California are the result of infection by fungi. These are microscopic plants with no leaves, roots, or stems, and cannot manufacture their own food. They rely on living plants and decaying organic material for their existence. 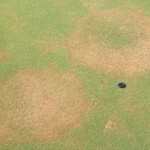 Three conditions are necessary for a disease to develop- the presence of the fungal organism, a suitable host (turf), and favorable environmental conditions. Temperature and moisture are the two biggest environmental factors. Not all diseases are created equal. Some will germinate in mild temperatures and moist conditions, others in hot, humid wet conditions. Since all fungi need moisture, irrigation becomes a major player in the equation. It is important to water deeply and infrequently. Water early in the morning, rather than late in the evening. This allows the plant to dry out during the day, and not remain in a moist environment during the most susceptible time of the day. 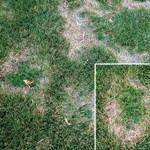 Low spots or areas that receive excessive water or poor drainage are a breeding ground for disease to establish. What you see is not always what you have. 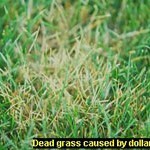 A small series of circular areas may in fact be any number of diseases; however it could also be pet damage, surface insects, or localized dry spots. 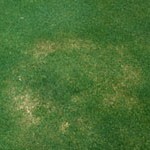 It is important to diagnose correctly before applying costly fungicides which may not provide any benefit. 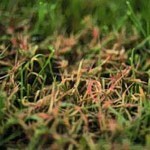 Rx Lawn Care Solutions will provide the right diagnosis and treatment to help your lawn recover. For additional information contact us for a free lawn care analysis.